Black Diamond is an interesting, luxury themed virtual slot by Antigua based provider, Octopus Gaming. The setting of the game encompasses a sleekly designed grid with a variety of clear-cut and shiny gems on black reels. This luxurious atmosphere is complemented by a backdrop of snowy mountain peaks and the sound of blowing wind. The RTP factor of this slot machine is 95.85% and its volatility ranges between low and medium. The highlights of the game include rich free spins round and random bonuses. The game is available in demo mode and it is compatible with all devices. 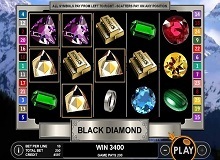 You can also play Black Diamond for real money in casinos online to try your hand at a mega jackpot of 6,000 coins. Gold Bars: They award a random bonus when they land on an active payline. One of the most impressive features of this casino slot is its simplicity. The game rules are simple and the gameplay is quite straightforward and smooth. You can play Black Diamond casino slot online using your phone or desktop. As usual, you have to select your wager before you can begin to spin the reels, and this machine presents you with a variety of options. The line bet amounts range from $0.01 to $5 hence the cost of a single spin is between $0.25 and $125. The bet is adjusted using the -/+ icons located on either side of the play button. Once you have placed your bet, the next thing is to hit the play button to get the reels rolling. If you don’t want to do this manually, there’s an AUTOPLAY feature on the screen that you can use to set up to 1000 automatic spins. Your winning in this slot depends purely on luck as the machine uses RNG technology to select winning lines for each round. This means that you can’t manipulate the outcome using cheats or strategies. 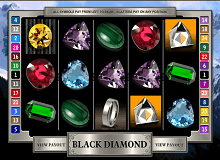 For you to win a round of the Black Diamond game, you need to land a set of at least three similar symbols on an active payline. All wins pay left to right; hence the symbols must align on successive reels, starting from the leftmost reel. Your winnings for each round are calculated by multiplying your line bet by the symbol multiplier. When it comes to the payouts, the Amber or yellow gem is the most valuable symbol with a jackpot prize of 6,000 coins for 5-of-a-kind. It is followed by the Ruby or red gem which pays at the rate of 1000 coins for the highest combination and then the Emerald with a payout of 500 coins for a set of five symbols. The icon with the lowest on Black Diamond’s paytable is the Ring and it awards 80 coins for 5-of-a-kind, 20 coins for 4 symbols, and 4 coins for 3. You’ll also notice that the Amber, Ruby, Emerald, and Amethyst also pay for 2-of-a-kind, which is quite impressive because it increases your chance of winning with each spin. The wild icon in this game does not pay, but it can replace other symbols on the paylines to form winning combinations. There are also no scatter wins or multipliers. Besides the payouts from the base game, you can boost your payback with a handful of Black Diamond free spins. This round is triggered by landing a set of 2 scatters on reels 1 and 5, and you can retrigger the reward with ten more free games if you land the scatters on the two reels again during the feature. This can go on and on. The other bonus feature in the slot is a random cash reward of between 40 – 600 coins each time you hit the gold bars on reels 2, 3, and 4. Every time the bonus is awarded, a small screen will appear on the grid to let you know about the reward, and you have to click ok to go back to the base game. 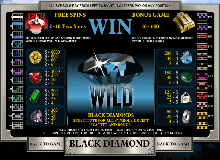 Black Diamond is a cool but fun slot that will impress any player with its simplicity and straightforward gameplay. When it comes to the rewards, this slot may lack some bonus features like wild and scatter pays or multipliers, but the free spins round and the random bonuses are rich enough to compensate for this. You can play Black Diamond slot machine online for real money to discover its amazing treats and with the mystic power of the black diamond, you might cash in on the jackpot reward.